When you put together a pair of clubs like the Vancouver Canucks and the Pittsburgh Penguins – two very talented clubs with impressive depth from top to bottom – it’s certainly a recipe for some intense hockey. And even though it’s only October – the season opener, nonetheless – the players said Thursday’s contest felt like a playoff game, with the teams trading chances back-and-forth as the game progressed into overtime and then a shootout. “It felt fast. It was an intense game. It was back-and-forth. Definitely high-paced." Despite the Penguins’ superb start – getting off to a 2-0 lead early in the game – the Canucks eventually shook off the rust and caught their stride as the game progressed, rallying to tie the game with just over 12 minutes left in regulation, forcing overtime and a shootout. Although Vancouver – with their potent offensive firepower in Henrik and Daniel Sedin (the last two league scoring title winners) and a Vezina Trophy finalist goalie in Roberto Luongo – is probably not high on Pittsburgh’s list of ideal teams to face in a shootout, the Penguins took it in stride. The Penguins kept their cool and held on for a 4-3 shootout win, with Evgeni Malkin sealing the deal in three rounds after Kris Letang scored a pretty tally in the first round for the team that finished with a 10-3 record in shootouts in 2010-11. Penguins center Jordan Staal left the game with just over four minutes left in the third period and did not return. Penguins head coach Dan Bylsma said Staal was "dehydrated." "He just was dehydrated a little bit, cramping up," Bylsma said. "There were no other factors." Before heading to the locker room, Staal skated 16:35 minutes and won 12-of-21 faceoffs (57 percent). Penguins center Evgeni Malkin made his mark in his first game back since suffering torn knee ligaments on Feb. 4 vs. Buffalo, scoring the game-deciding shootout goal on a beauty of a move. He pulled out the kick fake and got Luongo to commit and go down on his stomach. 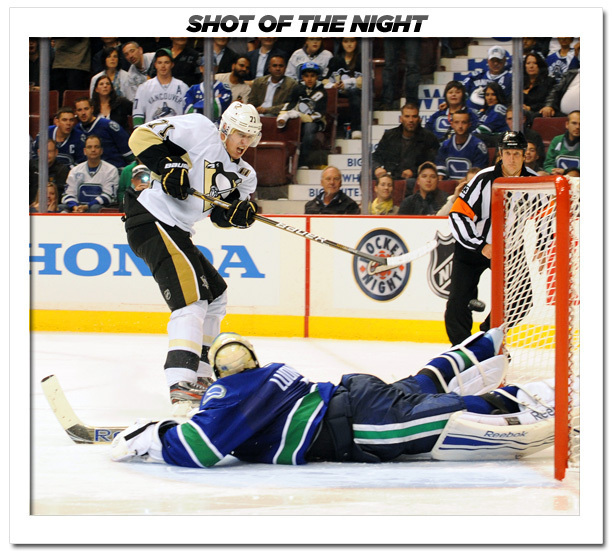 Malkin then patiently lifted the puck forehand over the prone goaltender. And although 'Geno' had been a beast in the preseason, leading the team and ranking third in the league with three goals and seven points through four games, he admitted to being a little anxious heading into Thursday. "I’ve not played in a long time," he said. "I was a little bit nervous before the game, but I’m glad we won and have two points." Although it was Vancouver who ended last season with the NHL’s top-ranked power play, on Thursday it was Pittsburgh who shined on the man advantage. The Penguins’ power play was a hot topic during the offseason partly because it finished 25th in the league in 2010-11, so having such a strong start is quite meaningful for this team. It finished an impressive 2-for-3 on the night (with Neal and Cooke getting the goals). And that statistic is slightly misleading because the third advantage lasted just 38 seconds. The Penguins’ top power-play unit had forwards Chris Kunitz and Neal down low, Steve Sullivan and Evgeni Malkin on the half walls and Kris Letang manning the center point. Prior to Thursday’s tilt, Penguins winger Matt Cooke hadn’t played in a regular-season game since March 20. However, he showed no signs of rust against the Canucks, scoring twice in Pittsburgh’s 4-3 shootout victory – his first two-goal contest since Nov. 16, 2009. He is now the NHL’s leading goal scorer (on pace for a 164-goal season!) and is tied for first with two points. And it’s only fitting that one of Cooke’s goals came shorthanded (his other coming on the power play), as he is one of the cornerstones of Pittsburgh’s talented penalty kill. After the Canucks scored on an odd angle to beat Penguins goalie Marc-Andre Fleury and cut Pittsburgh’s lead to 2-1 late in the first, ‘Flower’ shook it right off and went on to have an outstanding game. He finished with 33 saves, 14 of those coming in the third period as the Canucks desperately pushed to win the game. Fleury had to thwart quality scoring chance after quality scoring chance against some incredibly skilled players. Not to mention the shootout, where he didn’t allow a goal. Despite getting so much pressure and so much work in his first game of the season, Fleury thoroughly enjoyed the challenge. With usual defense partner Brooks Orpik sidelined for Thursday’s game as he continues to recover from offseason surgery, Kris Letang – who played in his 300th career game – had a big enough game for the both of them. Letang, 24, normally plays the right side, but switched to the left in Orpik’s absence. It didn’t cramp his style at all, as he finished with two assists and a gorgeous shootout goal while logging an impressive 27:06 minutes of ice time. He also looked comfortable and confident manning the center point on Pittsburgh’s power play. There couldn’t have been a better Penguin to score the first goal of the year than James Neal, acquired by Pittsburgh just before the trade deadline last season. “It was good to get off to a good start,” Neal said, who played right wing on a line with center Evgeni Malkin and left wing Steve Sullivan. The power forward tallied just over five minutes into the game on a power-play opportunity. On the play, he received a cycling pass from Malkin, and whipped what seemed to be a centering pass at the net. However, it took a funny bounce off Luongo’s pad and went in. Neal finished with a game-high five (tied) hits, three shots and two takeaways – oh, and a scorcher off a set faceoff play that clanged off the post. Not a bad night for the 24-year-old, whose game fits well into head coach Dan Bylsma’s system.